Gaeng som (also sometimes spelled kaeng som แกงส้ม) in Thai means sour curry or sour soup. 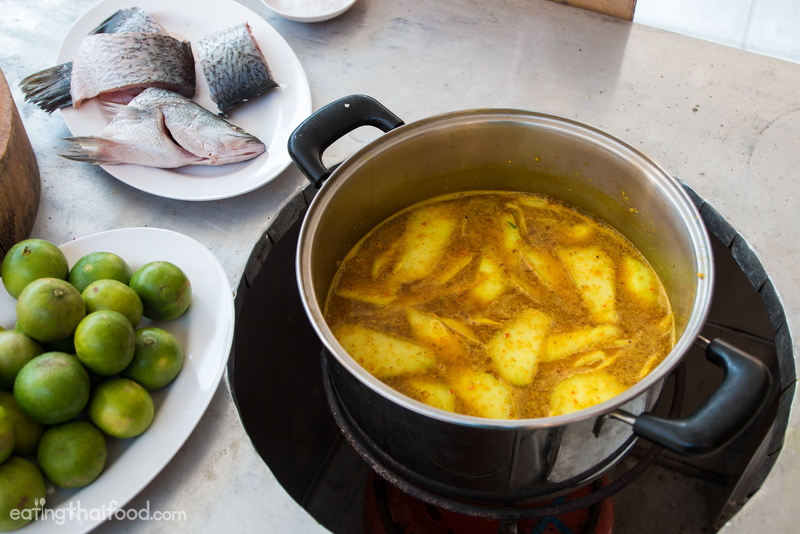 In Thailand you’ll find a number of different variations of gaeng som, sour curry, but I’ll be sharing the distinct southern Thai recipe for this delicious dish. 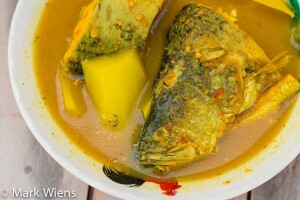 In this post I’m going to share my mother in laws recipe for gaeng som (แกงส้ม), a fiery, turmeric filled, fish soup. It might be helpful if I just quickly go over the basics of Southern Thai gaeng som (แกงส้ม). Firstly, if you order gaeng som in central Thailand, it’s a completely different looking curry / soup and flavor. It’s reddish in color and tastes almost like sweet and sour soup – typically too sweet for my taste. 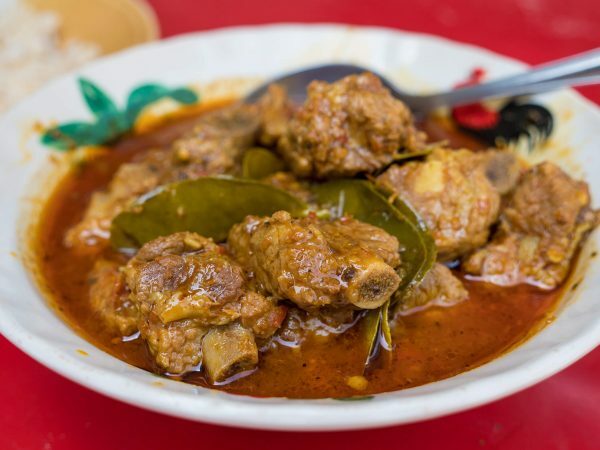 To not get mixed up, in Bangkok and other regions of central Thailand, southern Thai gaeng som is usually referred to as gaeng leung (แกงเหลือง), which translates to yellow curry. In the south of Thailand though, this dish is known as gaeng som, and that’s what we’re making in this recipe. Just like with the kanom jeen nam ya recipe, this recipe is another dish my mother in law cooks frequently when I’m at home in Thailand. In fact, I love gaeng som (แกงส้ม) so much, that I wouldn’t say it’s my all-time favorite southern Thai dish, but I would say it ranks very high, and it’s something I enjoy eating a few times a week because it’s healthy, not oily, satisfies my love for spiciness and extreme flavors, and it’s just all around an incredible dish (แกงส้ม). Gaeng som (แกงส้ม) throughout most parts of southern Thailand is a standard dish, something that’s available at all southern Thai restaurants, and cooked at home. When you go to a southern Thai restaurant, it’s a dish that is always available, sometimes in a couple of different variations. NOTE: Like all my recipes, if you want to get straight to the cooking, watch the video and scroll below to the recipe and directions in the recipe box. But keep reading below for more of an in-depth overview of gaeng som and my personal tips. 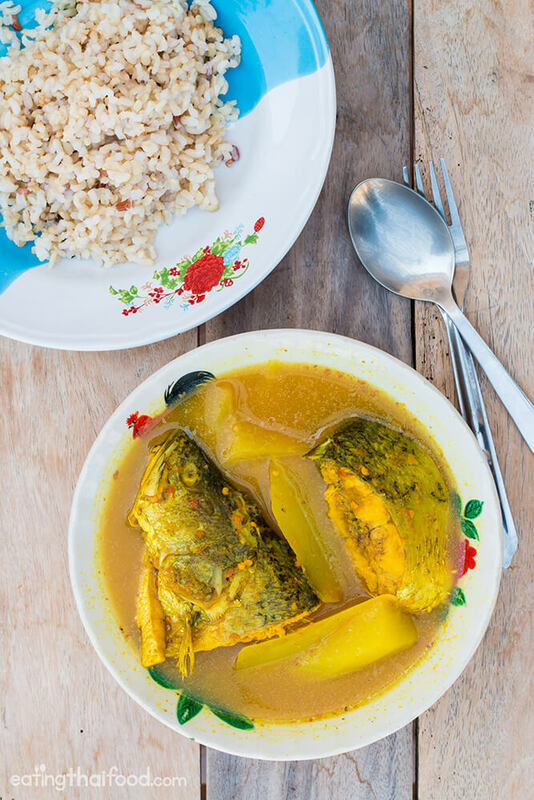 Southern Thai gaeng som (แกงส้ม) is typically made with fish, and almost any type of fish will work, as long as it’s ocean fish, and since the fish is boiled, a firm fish does best. 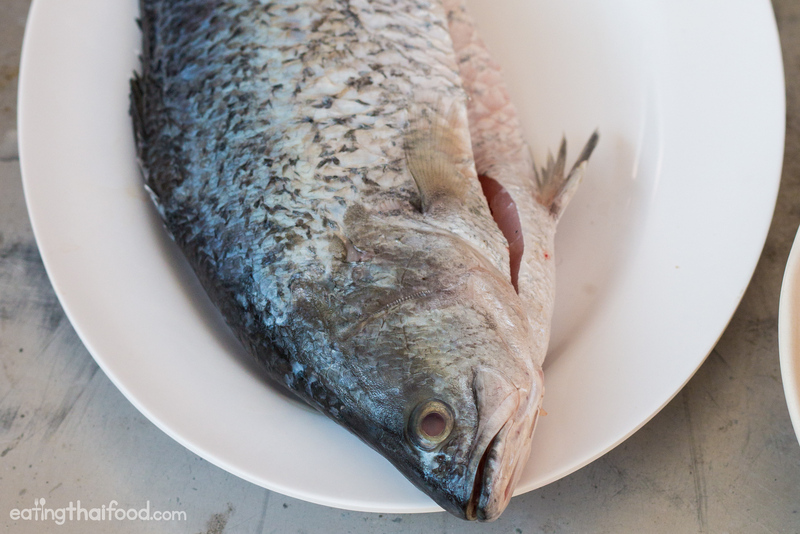 Also, you don’t need to worry so much about the top fish quality, as that might be better grilled or steamed, but even previously frozen fish works well with this recipe. 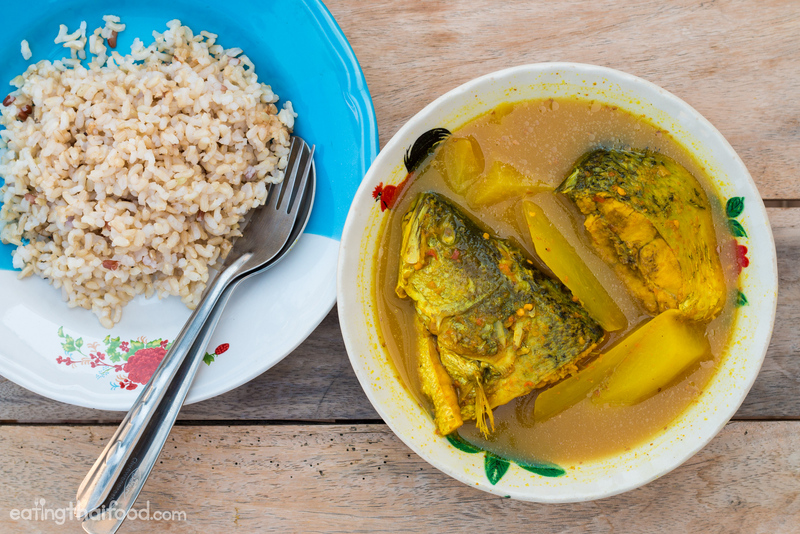 For this gaeng some recipe I’ll be using barramundi (Asian seabass), which is easy to get in Thailand and is a common fish to make this Thai sour curry with. Make sure the fish is gutted and cleaned, and then cut it into steak pieces (cross section chunks), a couple inches wide. I cut my whole fish into 4 pieces. Just like you can use different types of fish, you can also include different types of vegetables in your gaeng som (แกงส้ม). Some of the most common ingredients include green papaya (like what I’ll be using here), taro stems, coconut shoots, bamboo shoots, pineapple, water morning glory, or flowers from the hummingbird tree. Typically just a single vegetable is used in gaeng som, but I have seen a mix of vegetables occasionally as well, like at Nong Joke restaurant in Krabi where they use coconut shoots, bamboo shoots, and dok khae flowers all mixed. If you use pineapple, it will give your gaeng som a sweeter flavor, and if you use green papaya, your gaeng som will be more spicy and sour. I like gaeng some with any and all the above, but especially with green papaya and with taro stems. Just like making Thai green papaya salad, you’ll need a completely green papaya – I’m talking not yellow or orange at all – fully green and hard. To prepare the papaya, peel off the skin, shave out the inside seeds, and then cut the green papaya into bite sized slivers – cut it almost like you’re whittling a piece of wood (make sure you watch the video to see exactly the way to cut the green papaya). Green papaya in gaeng som has zero similar taste to a ripened orange papaya. Instead it’s more like a winter-melon. Unlike a Thai soup like tom yum that uses an infusion of herbs for its flavor, gaeng som (แกงส้ม) uses a curry paste for its flavor – that’s technically why it’s a curry, though it could pass for a soup. 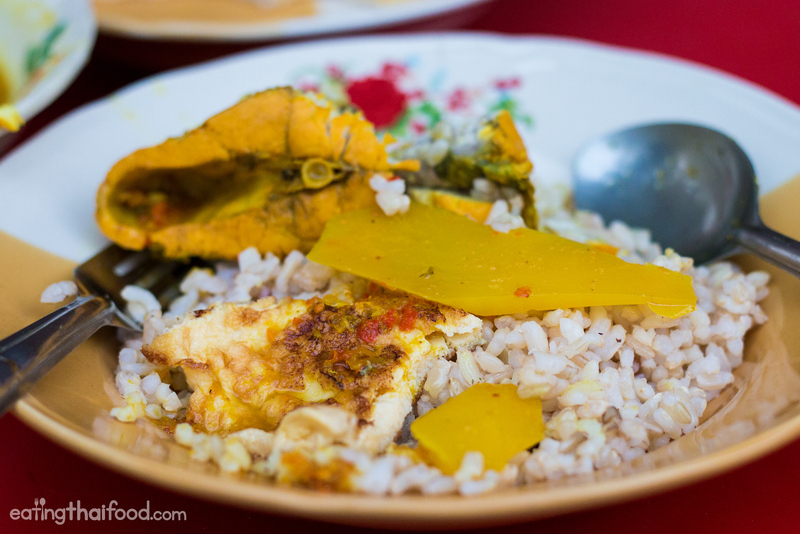 The gaeng som curry paste is similar to a typical southern Thai curry paste, but it’s more heavy on the chilies and turmeric. While you could pound all the ingredients by hand using a mortar and pestle, and I’m typically all for sweating it out and making Thai curry paste by hand, for this gaeng som recipe, since it’s boiled like a soup, I usually just blend the ingredients. Fresh turmeric rhizome is an absolute necessity for southern Thai gaeng som (แกงส้ม), there’s no replacement. It gives the soup its unforgettable orange color and a mustardy flavor. Chilies are another major ingredient in the curry paste for gaeng som, it’s a curry that should burn down your throat with every bite – in a very good way. You can use just normal Thai bird’s eye chilies for this recipe, the dark red colored ones, but the best chilies to use are the slightly smaller and neon colored red and green chilies in Thai called prik kee noo khao (พริกขี้หนูขาว). 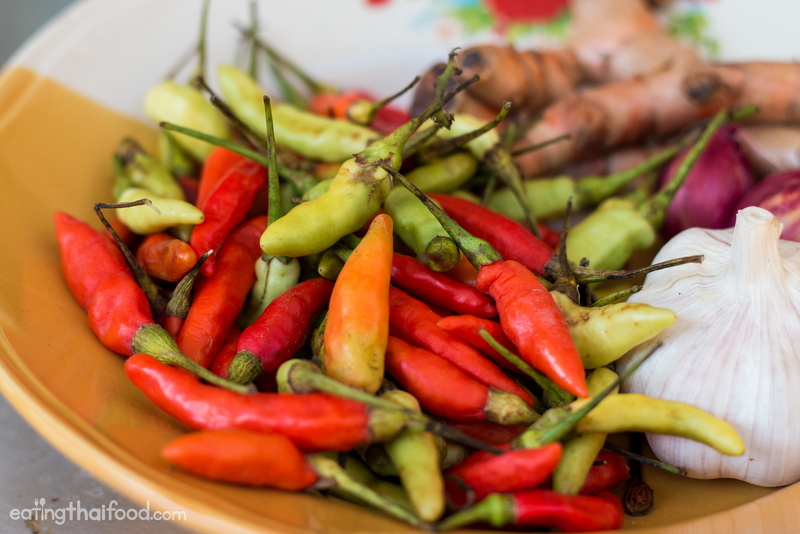 These chilies are especially common in southern Thailand, but you can also find them sporadically throughout markets in Bangkok and I believe I saw them at an Asian supermarket when I was visiting the US. 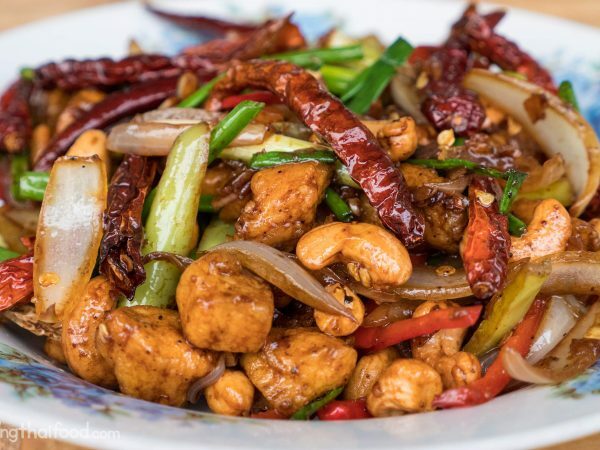 They are usually a little more spicy than regular bird’s eye chilies, and have a little more of a sour flavor to them. 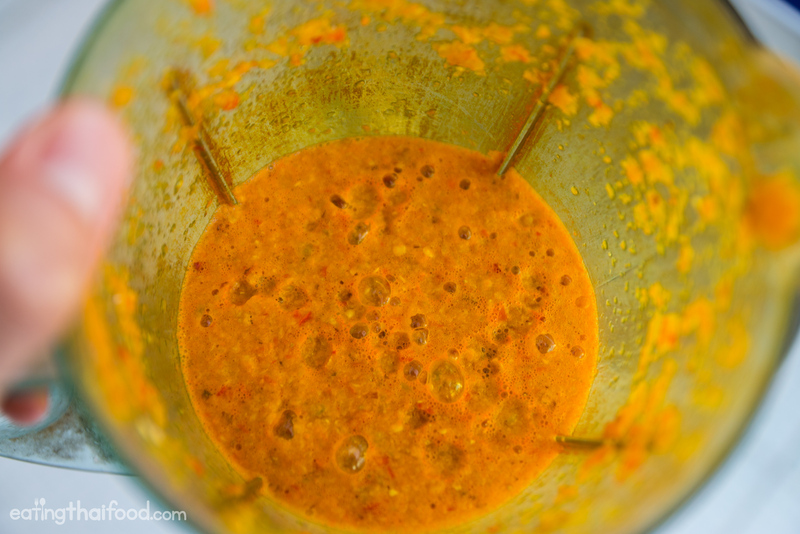 Be careful, turmeric will stain your blender yellow! Along with the turmeric and chilies, peel the garlic and shallots, then add about a cup of water, and blend everything up into a coarse paste. A blender or food processor will work fine. Don’t smell it too full on, or the vapors from the chilies will make you gag. That being said, it will smell marvelous. WARNING: Turmeric stains everything yellow orange. I’ve found that it really stains on plastic, but it probably won’t stain on glass. Just to let you know before you borrow your friend’s Vitamix for this recipe. The two biggest flavors of Southern Thai style gaeng som (แกงส้ม) are spicy and sour. And even in the south, there are a couple of different types of sour fruit that are used for the cooking. Sometimes limes are used, and sometimes sour tamarind is used. It’s good both ways, but I’m making my mother in-laws recipe, and she takes her style mostly from the Nakhon Si Thammarat province of Thailand and used only lime juice. 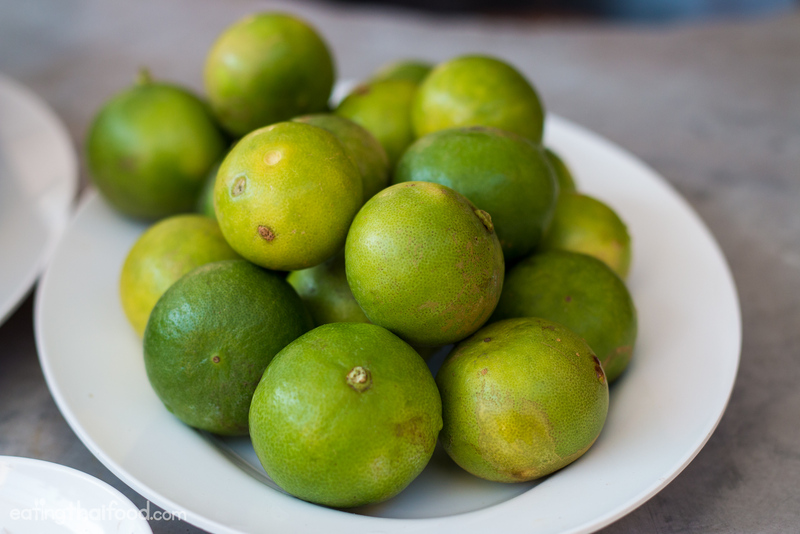 What I like about using just lime juice for sourness in gaeng som is that it’s sharp, without any sweetness. You’re going to need a plateful of limes. I used about 20 limes, which was approximately 15 tbsp, but you need to add and taste test depending on how much water in the soup you have. When you have free time, cut and squeeze the limes. In the video, I did it right after putting the soup on to boil. 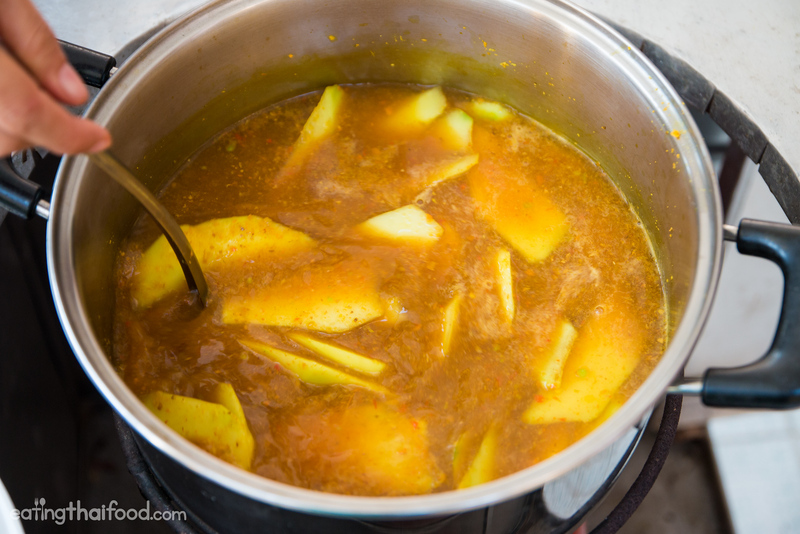 Once you have your gaeng som curry paste pureed, dump it straight into a soup pot, and rinse out your blender with about a liter of water and add all that to the pot. Turn on your stove to a medium heat. Then add about an extra liter of water, so about 2 liters of water in total. Mix it quickly, then add the shrimp paste. 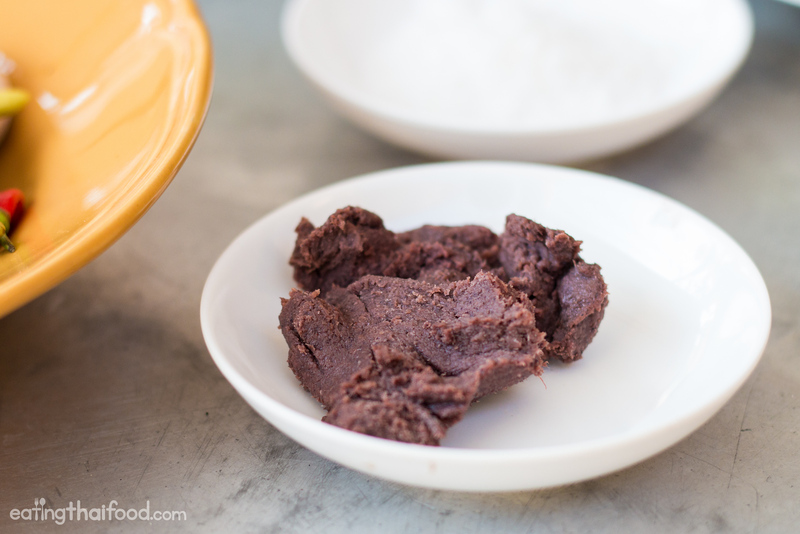 Make sure the shrimp paste mixes in thoroughly and dissolves – as the water heats up it will dissolve easier. Then add the sliced green papaya, or whichever vegetable you’re using. At this point you can put on the lid of your pot, and you want to bring the soup to a boil before you do anything else. 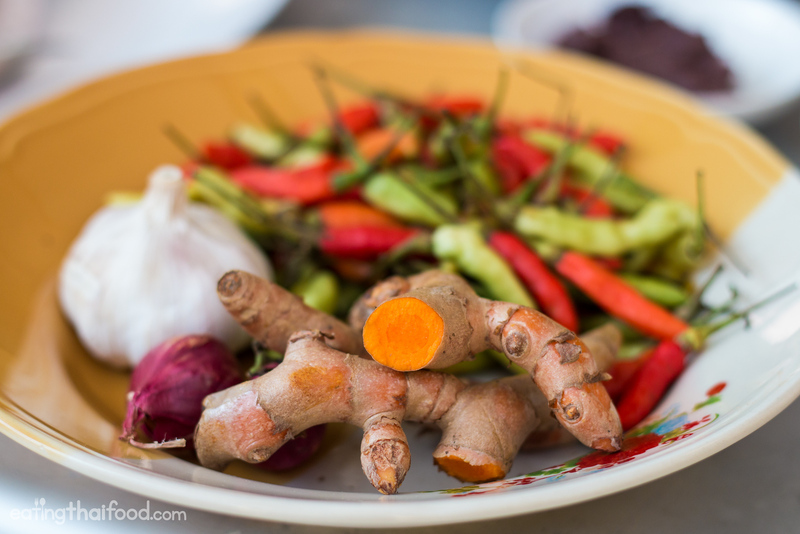 There are a lot of general tips and practices about cooking Thai food in Thailand that you’d never guess on your own (at least that’s the case for me) – I learn something new all the time. 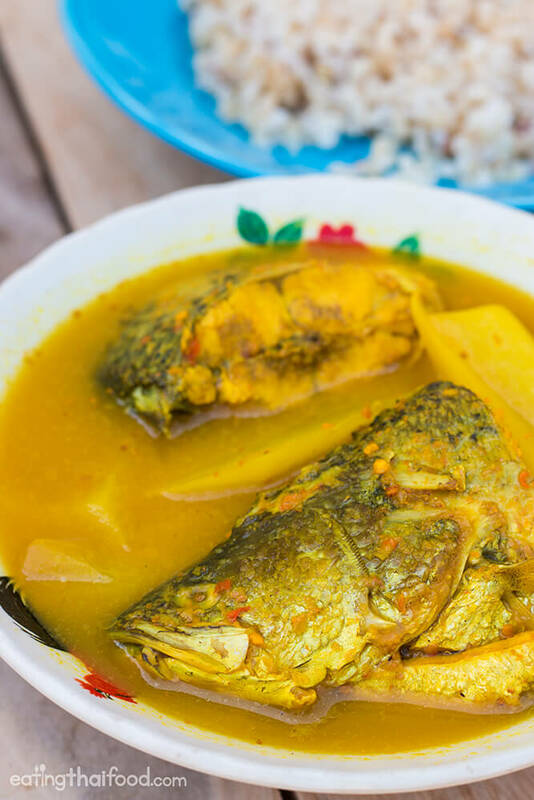 One of those Thai cooking theories that seems to be accepted and acknowledged by all Aunties in Thailand is that once you add fish to any soup, you should not stir the soup until the fish is fully cooked. If you stir the soup when the fish is raw, the entire pot of soup will be men khao (เหม็นคาว), a term in Thai that translates, in this case, to a bad fishy aroma. I’m not sure if it’s a Thai mother in-law / Aunty tale, but I’m not going to argue. I follow their instructions, and I’m sure it’s been tested for hundreds of years. So gently add the fish to the soup, then without stirring, boil for about 5 – 8 minutes, until the fish is pretty much all the way cooked through. The final step is to turn off the heat completely, and remove your pot from the burner. Then add salt and lime juice, and gently stir, making sure you’re careful with the pieces of fish. Add the lime juice at the end like this to preserve its sourness. Taste test your gaeng som to make sure it’s spicy, sour, and it should make your tongue tingle from the chilies. Once you’re geang som (แกงส้ม) is ready, dish it into a bowl and serve with rice. In Thailand gaeng som (แกงส้ม) can be eaten directly over rice with a variety of other curries on the side, or in a side bowl so you can take more advantage of the curry broth. For more authentic Thai recipes, see my whole list here. This recipe is for Southern Thai gaeng som (วิธีทำ แกงส้ม, แกงเหลือง), a sour curry, but more of a soup, filled with chilies, lime juice, and turmeric. 1 Barramundi fish, or other ocean water fish (ปลากระพง) - My fish was approximately 600 grams, but you could add more or less as you please. Begin by making the curry paste. Peel the stems off all the chilies, then add them to a blender or food processor. Peel the garlic, and shallots, and cut the turmeric into pieces, and toss them all into the blender. Add about a cup of water, and blend for a few seconds until pureed. NOTE: Be warned that turmeric stains, so don't use a nice blender! 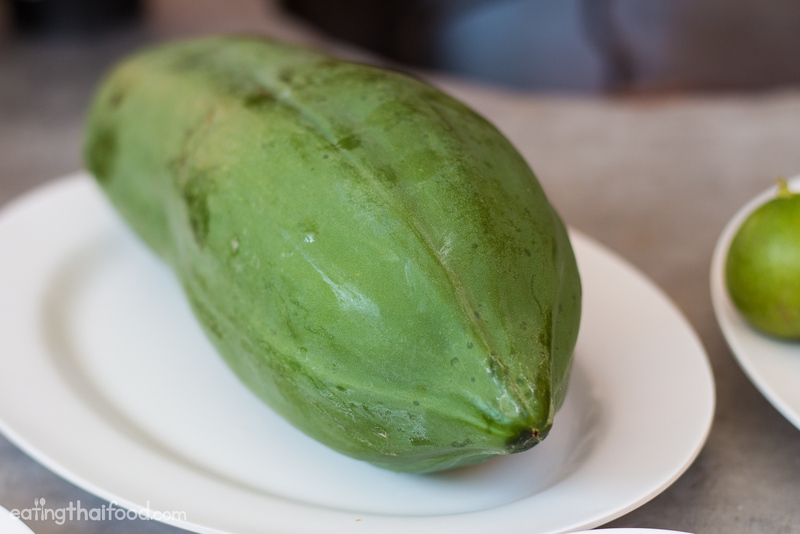 To prepare the green papaya, first peel the outer green skin, rinse it in water to remove the sap, then shave off thin bite sized pieces of papaya so you have thin wedges. Cut the papaya like you're whittling a piece of wood. Then set aside. For the limes, slice and squeeze them into a separate bowl. Put a big soup pot on the stove and turn to medium heat, and add in all the curry paste you just blended. Add 2 liters of water to the soup, using some of the water to rinse out the blender, and add to the pot. Add the shrimp paste, and stir the soup to make sure the shrimp paste fully dissolves. Take the green papaya, add it all to the soup, stir quickly, then put the cover on to bring to a boil. Once the gaeng som is boiling, gently add the pieces of fish. But here's the Thai Aunty trick - don't stir the soup until the fish is fully cooked. 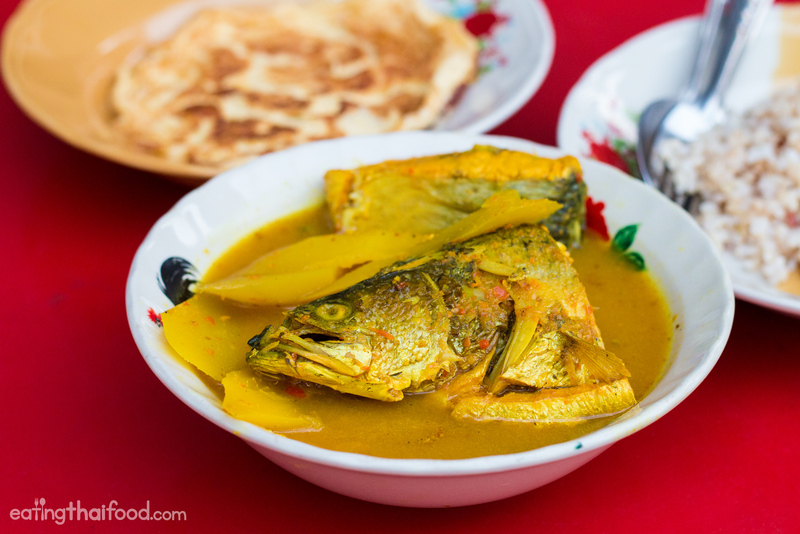 If you stir the soup when the fish is still raw, your soup will taste fishy (according to Thai cooking practice). Boil the soup, without stirring, for about 5 - 8 minutes. When the fish is finished cooking, you can stir gently, and then turn off the stove pretty quickly so you don't overcook the fish. Once your heat is off, it's time to season with salt and lime juice. Add some at first, stir gently, taste test, then add more if needed. Taste test until your gaeng som is sour, slightly salt, and extremely spicy. Southern Thai gaeng some is one of the most popular and widely available dishes in southern Thailand. It's typical to eat along with a plate of rice and a variety of other curries and side dishes. It's also delicious with a Thai omelet on the side. Hope you enjoyed this authentic Thai recipe, and be sure to check back for more! One of my favorite ways to eat gaeng som (แกงส้ม) is not only with rice, but also with a Thai omelet. Just fry up a Thai style omelet, put pieces of omelet onto your rice, then dish out some of the spicy sour gaeng som soup over it. Gaeng som kab kai jeow (gaeng som with an omelet) is something my wife loved to eat before I ever came to Thailand, and it’s become one of my ultimate comfort meals. When my wife and I go on a trip outside of Thailand and return, we usually order gaeng som and an omelet from my mother in-law to make on our first meal back home. Hope you can give it a try. It goes together so well! There are a number of different types of gaeng som (แกงส้ม) in Thailand, but this recipe is for southern Thai gaeng som (also spelled kaeng som), sometimes referred to in Bangkok as gaeng leung (แกงเหลือง). Southern Thai gaeng som (แกงส้ม) is a sour curry or sour, teeming with chilies, lime juice (or sour tamarind), and distinctively orange in color from turmeric. The flavor, if made correctly, should be pungently strong, burn your throat with every bite, and it should be sour enough to make your cheeks tingle. I hope you enjoy this southern Thai gaeng som (แกงส้ม) recipe. Please let me know if you have any questions. Leave a comment below, I’d love to hear from you. What kind of rice is that in the pictures? It doesnt look like Jasmine. It almost looks like brown rice. Have you ever though of adding big pieces of thai omelet to your gaeng som, when you take it off heat, or when you add fish? Different textures, and omelet curries are very popular in India. Many different styles. Also, we love the boiled eggs that have been fried, for the texture, in wet dishes. Hey GTM, great to hear from you. Yes, I have done that before and it works incredibly well. Thanks for the ideas. In India I’ve had a few hard boiled egg curries, but I don’t think I’ve ever had an Indian omelet curry. That sounds delicious! Hi Mark, first of all, I got my tee shirt today. Thank you very much! Secondly I made a derivation of this dish today with shrimp. I made a shrimp stock with the heads and shells and used it to replace the water. And I added some fresh Galangal to the curry paste. I made the paste exactly as directed otherwise (in my vitamix) and of course it stained the plastic but the tried and true cure of rubbing and soaking with vegetable oil pulled the stain right out. This works with anything that stains plastic, beet juice, carrot juice, etc. I am looking forward to my trip to Bangkok in September. Although it will be a brief six days and very restaurant oriented. Keep up the good work! Hey Serina, this is awesome to hear, glad you and your husband love gaeng som as well. Enjoy! My fav dish! Although it depends on how it’s made, I prefer it very sour and spicy and some regions make it quite sweet. What I love most about gaeng som is how versatile it is, with various veg and herbs being used, depending on who is making it. I’ve got to start cooking it at home! Hey Elizabeth, it’s great that southern gaeng som is one of your favorite dishes as well. I’m with you too on the flavor, I love the sour and spicy ones – the one especially from Nakhon Si Thammarat. Glad you’re cooking it at home! Hey Jay, good to hear you love southern style gaeng som as well. I like it with pineapple too! 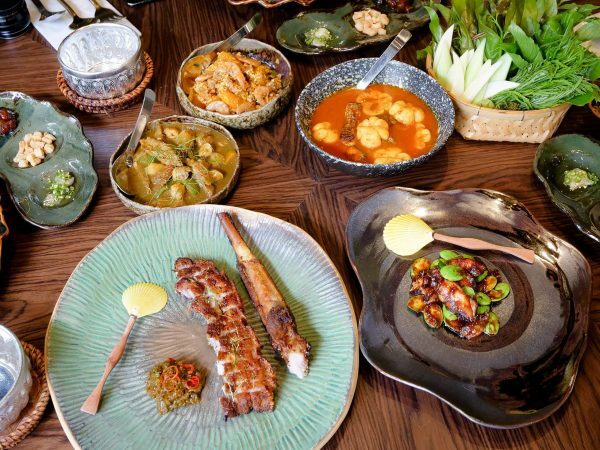 Welcome to southern Thai food! I’m confused though in your video you have nowhere near 100 chilis, and 60 grams of chilies isn’t anywhere near 100 chilis either. I used 60 grams and it was like, 25 chilies. And it was very, very spicy. Hi Kris, it was 100 chillies, but they weren’t the normal Thai birds eye chilies, but the smaller pastel colored ones. I will double check again next time, but that’s what I counted when I was making this recipe. But for the authentic recipe, it should be very very spicy – it should burn.